After a few months hard work I finally found the time to write a new weblog entry. It's a bit harsh that I should start again with some rather sad news. But nevertheless I feel the need to write something about Michel "Da Capo" Terstegen, who passed away on July 4, 2011. Michel is of course best known for his record shop in Utrecht, but that's not how I became acquainted with him in the first place. Michel was also a frequent visitor (if not deejaying himself) of many sixties themed parties. Parties which I, not quite coincidently, also like to go to. On those parties I got to know Michel as a very enthusiastic, kind and warm-hearted person. Despite his age - he's about five years older than me - he had always kept a boyish charm, which made his companionship very pleasant indeed. No need to tell you we always welcomed Michel with open arms. But there's more to Michel. Michel was part of the mod revival movement in the late 1970s/early 1980s. I've always been a bit envious of that. Or should I say fascinated? I guess a bit of both. When I was 14 years old I saw the motion picture Quadrophenia. I was quite impressed by that movie and walking out of the cinema that night I decided I wanted to be a mod too. But there weren't any mods in Rotterdam at that time and I had no frame of reference at all, other than the movie. I didn't know where to buy the right clothes and I didn't know where to buy the music. It didn't help either that I was a very shy boy and nothing like the adventurous kind. So I kept on daydreaming and stayed just how I was, which was nothing outspoken really. A year later I learned that there was a mod scene in Utrecht, but I did nothing with that knowledge. Utrecht was just a step too far away for a shy boy like me. The early 1980s also had its rockabilly revival. My friends at that time were much more attracted to that rather than this mod thing and so they became rockabillies. Well, you know what they say; if you can't beat them, join them. 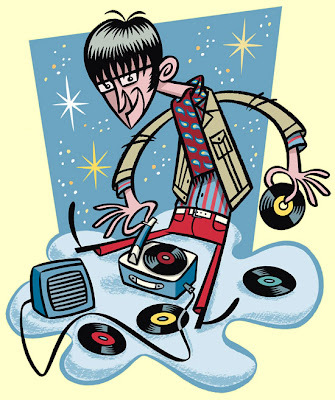 I have to say, I've enjoyed being part of a youth culture and I still like a good rockabilly tune, but my fascination for everything mod kept on itching. By 1986, at the age of 21, I became more self confident and a little bit more adventurous. Consequentially my preferences for mod clothing and music became more outspoken. I guess that in the end I became, although not planned as such, a mocker. I can't exactly remember when I met Michel Da Capo for the first time, but it must have been somewhere around the mid-nineties. From the moment that I found out that Michel had been part of that legendary mod revival scene in Utrecht, I always kept on asking him questions about that period. Luckily Michel was always happy to tell about those days. Listening to his stories it somehow made up for the all the things I missed out on because of my lack of will power to become a mod in the late 70s. The last time I spoke with Michel was on August 28, 2010. That night I was questioning him again about the ol' days. Somewhere during the conversation I blurted out that one of the reasons why I appreciated mods, was that they were always well mannered (I'm not referring to the beach riots of 1965 of course). "Well mannered!?" Michel replied, "Pieter, you couldn't be more wrong! We weren't well mannered at all!" He told me that from time to time, whilst hanging out, the Utrecht mods got rowdy. When the battle cry "Slooopuuuhh!" sounded, these angry young men started to demolish anything on their way, like running over and jumping on parked cars and more of that sort of thing. Now of course I don't approve of that sort of behavior, but I just adored hearing Michel telling about it with that mischievous sparkle in his eyes. On top of that, it was my last conversation with him and because of that I will always treasure this story. Michel passed away way too soon. He was still in the midst of life. Also he wasn't given much time to say goodbye to the life he enjoyed so much. Hardly half a year after he had heard the horrible news that he was suffering from stomach cancer Michel's body gave up. I didn't see Michel whilst he was sick. I didn't see the decline of his body. In my memory I still see him as lively and cheerful as ever and that image is very vivid. I went to his funeral last Saturday. I listened to the farewell words of his beloved ones and somehow it felt that something didn't fit. Sure enough these words were all about Michel Da Capo, but I could not match the farewell outings with Michel who's still so very alive in my memory. I just couldn't imagine him being dead. "This can't be the same Michel I know", I thought to myself. "You'll see for sure, the next 60s party we're having, he'll come walking in just as he always used to do". I don't think this feeling will change. At every party we'll enjoy in the future Michel will be present. Probably over the years my common sense will make me see that it isn't possible anymore that he'll be there in the flesh, but then again, in spirit he will always be. Mooi verhaal, en mooie tekening! Pieter M. Dorrenboom is a Dutch illustrator. On this weblog he will keep you informed of his latest work, open up his archive to show you some of his older work and blog passionately about everything that inspires him.